Have you noticed? Needle Felting has become quite the popular craft in recent years. When I first started my adventure into the fiber world, most people (including me) had never heard of wool felting much less Needle Felting. So, What is Needle Felting? Basically, Felting is the process of producing felt, a textile or fabric that is made by combining and compressing loose fibers or hair. With Needle Felting, that is accomplished by matting the wool with a special barbed or notched felting needle. 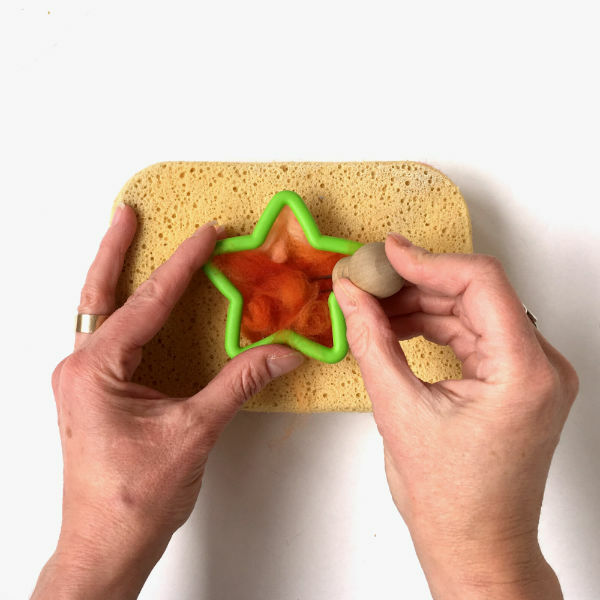 It’s a dry felting method, as opposed to wet felting which you can learn more about here. There are various methods of needle felting. In this tutorial, I’m going to show you how to make a simple thin, flat piece of felt with wool roving. We will shape these pieces by felting the wool inside cookie cutters. These wool shapes can then be used as patches or decoration for clothing but they also make fun little Christmas ornaments. What do I need for Needle Felting? 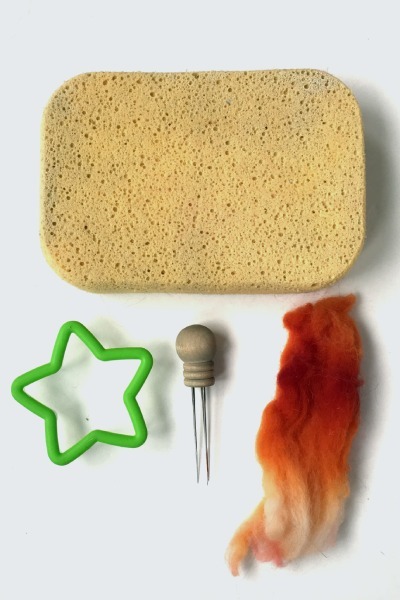 The basic tools you need for this fiber art are felting needles, wool, cookie cutters and some sort of underlayment like a felting pad or a very thick sponge. Depending on which part you are trying to felt, you can use either a single needle or multiples. For example, smaller areas and edges are easier to felt with just one needle. 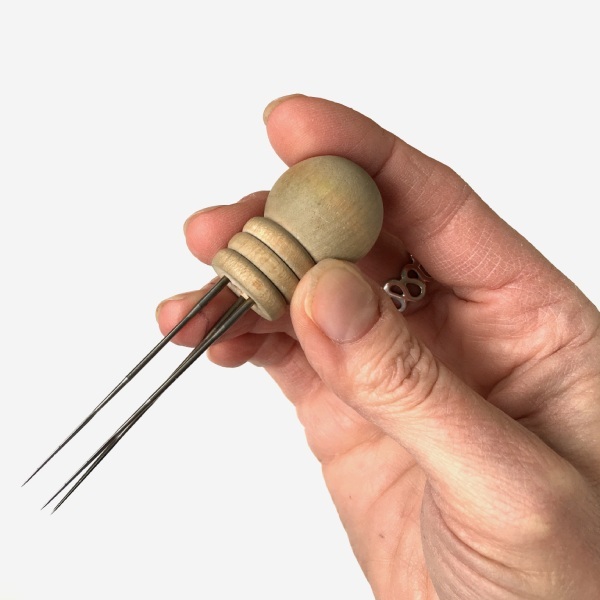 Conversely, a needle felting tool is useful for larger areas as it holds several needles and you can complete those parts much quicker. CAUTION! This is not a suitable craft for young children. Felting Needles are extremely sharp! Next, you need some type of wool. This can be in the form of raw sheep wool or fancy mohair or alpaca fiber. It’s entirely up to you. As a beginning felter, wool roving is probably a good choice. Plus, you can find roving in many wonderful colors. A felting pad is simply a think piece of soft material which has two main purposes. First, a felting pad protects whatever is underneath the wool such as a table or your lap. Second, it gives the felting needles something soft to stick into so they don’t break. 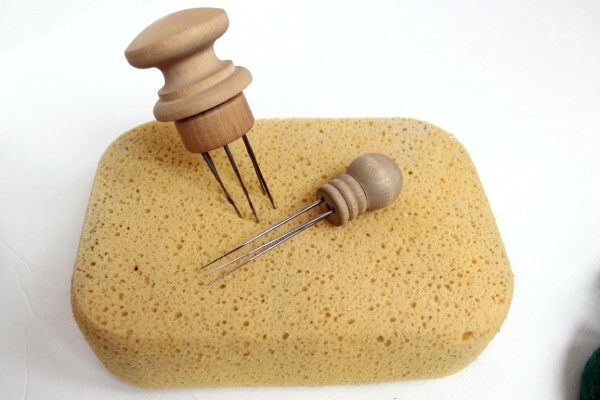 For this purpose, you can also use a thick sponge like the ones they sell at a hardware or automotive store. 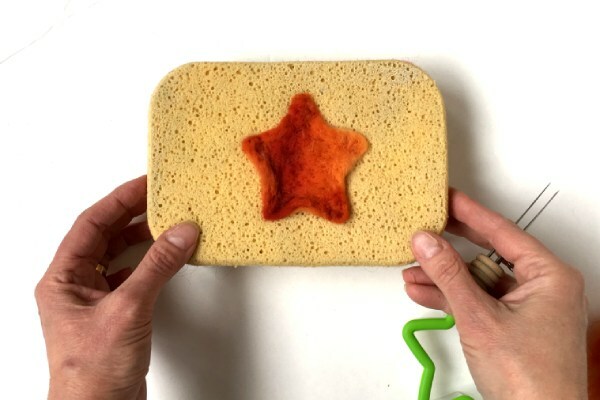 They are cheap and easy to find but the downside is that those sponges don’t hold up very well after several uses. Therefore, if you’re going to do several needle felted pieces, I recommend using a felting pad. They last much longer and you should be able to find one at a craft store or your local yarn shop. 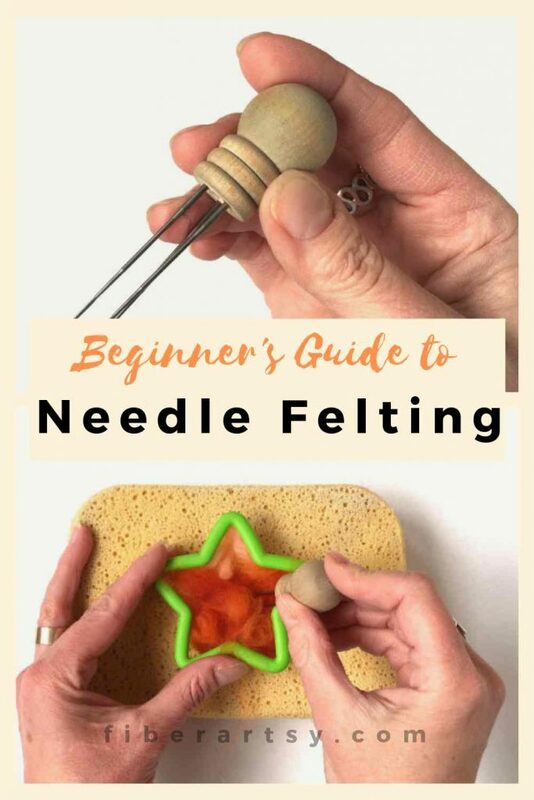 You can use any type of cookie cutter but beware that felting needles are fairly fragile and more likely to break if they hit metal instead of a plastic cookie cutter. While not absolutely necessary, you may want to get some finger protectors. You would be surprised how many times I stab myself with those felting needles. First, you will want to thin out your wool roving. In general, it’s better to felt several thin layers of wool as opposed to one thick layer. Using your hands, gently open up the wool roving (side to side) until you can just see through it. 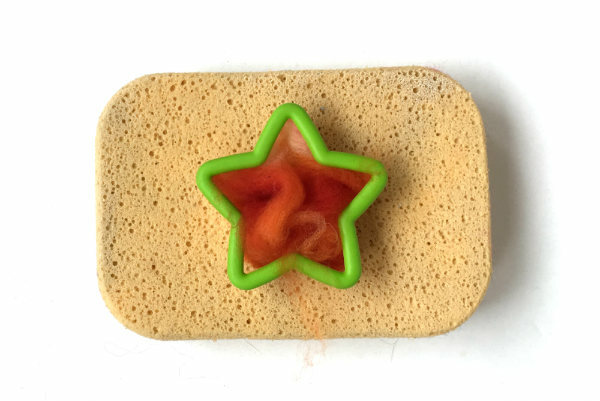 Next, place one of the cookie cutters on top of your felting pad or sponge. Then put a thin layer of roving inside the cookie cutter. If you’re using finger protectors, go ahead and put those on as well. 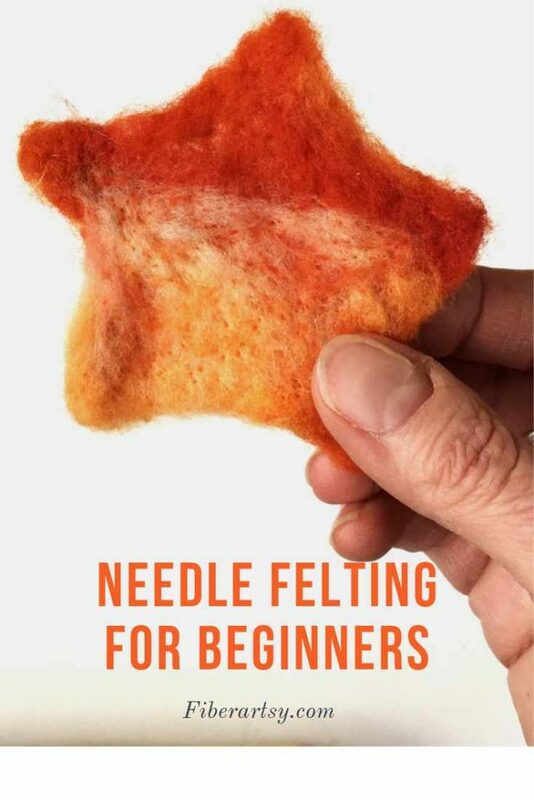 Now, you are ready to begin needle felting. Now, take your felting needle or tool and very carefully begin poking through the wool into the felting pad and pulling the needle back out. Do this very slowly at first and keep your hands out of the wool! Trust me when I say you don’t want to poke yourself. Continue poking the needle in and straight back out again. Make sure and do this all along the edges as well. You will start to see the fibers blending and matting together. Once you have felted the top side of the wool for a few minutes, remove the cookie cutter and set aside. 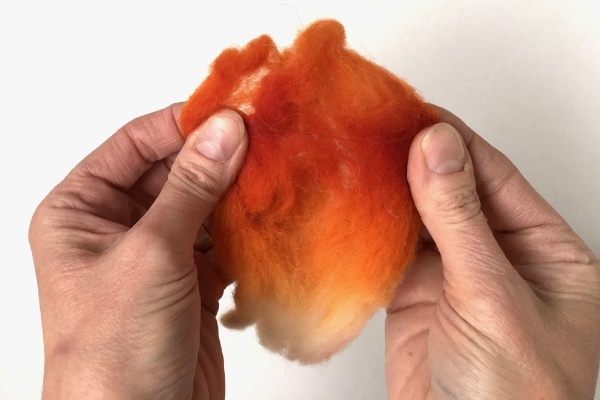 Now, using your fingers along the edges, carefully peel the felted wool off the felting mat. It will probably lose some of its shape but that’s okay. Flip over your felt and place it back in the cookie cutter. Begin felting this side the same as the first. Carefully working the entire surface of the wool. Pay close attention to felting the corners and edges. Repeat the above steps: Peel the felt from the mat and turn it over. Now add another layer of wool and keep needle felting. Continue until the wool is thoroughly matted. To test the felting, gently pull at the piece and see if it comes apart. Once your wool is holding together well and not coming apart, your felt is ready to use. If you are making an elbow patch or decoration, your piece is finished. You can make it thicker by adding more wool. Also, you can embellish it with different colors of wool to make faces, etc. 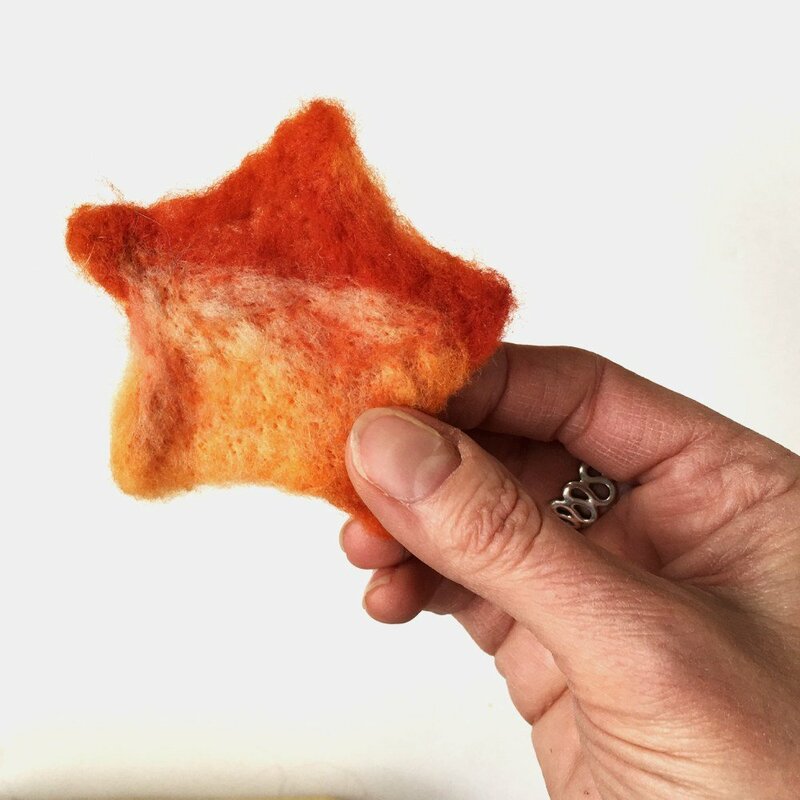 If you want to make a 3 dimensional felted piece such as a Christmas ornament, just continue adding layers of wool and felting all sides including the edges. 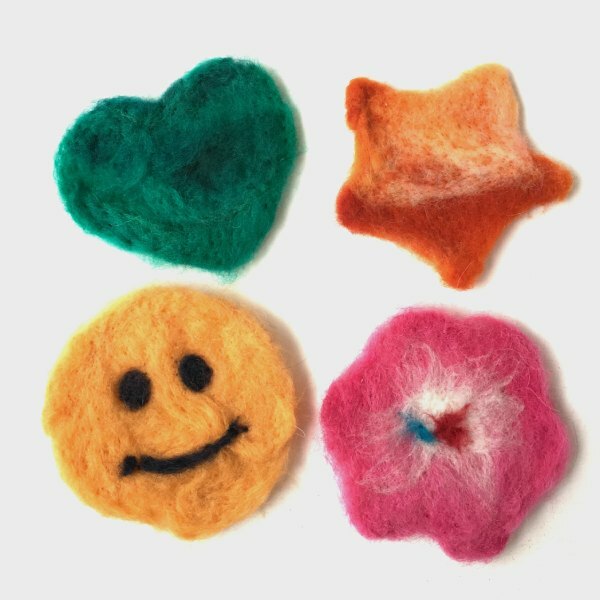 See how easy it is to make fun needle felted shapes using cookie cutters? 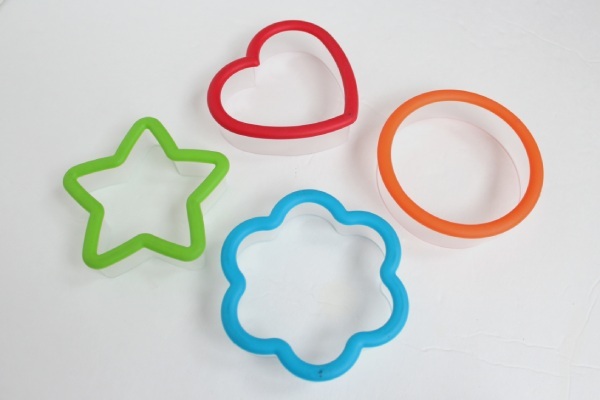 And since cookie cutters come in all shapes and sizes, you can personalize them for your loved ones. Do you have someone that’s into horses? You could needle felt a Christmas ornament or gift tag in a horse shape with brown wool roving. The options are virtually endless. This post covers just the basics of how to needle felt wool. 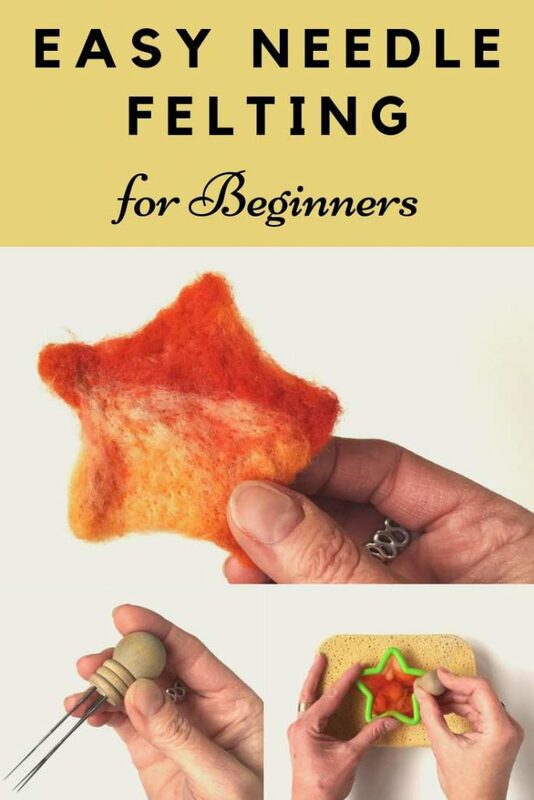 It’s also possible to make 3 dimensional felted pieces. Have you seen the super cute needle felted animals? Those are made with a more advanced, 3 dimensional technique. Some felters use a type of armature or wire skeleton to give the piece structure. But, I’ve also seen needle felters make their animals with nothing but wool. 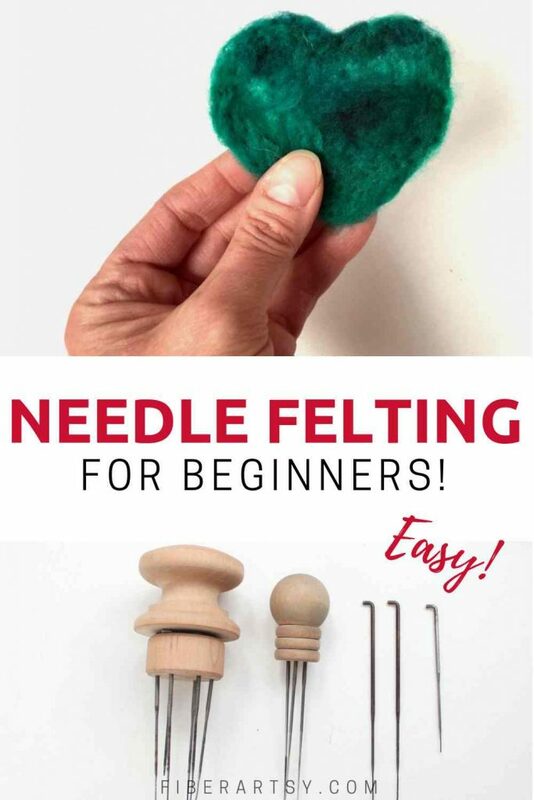 If you want to learn more, Wiki How has a great article showing you three different ways to needle felt. 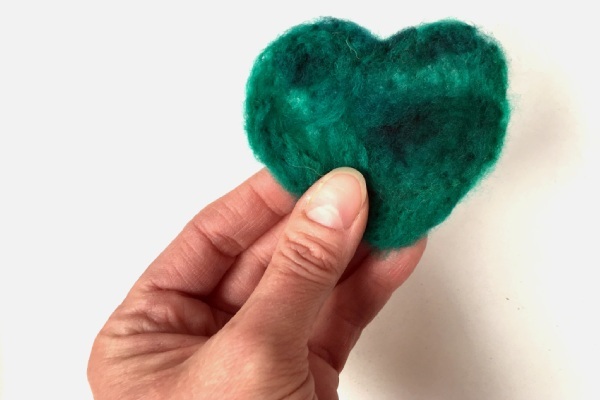 Have you tried needle felting? I’d love to see your creations.